I came across this quote on Jess Knott’s Instagram and had an immediate light bulb moment. This is exactly what Virtually Connecting was for me. But also what it can do for people who cannot do that for themselves. Because as much as I love love love that quote, it’s incomplete. And I’ll explain why. In real life… When you’re in a place and you want to sit at a table… It’s not easy to invite yourself even if there are seats available with nobody’s name on them, right? I’m thinking kids in school and lunchtime and how difficult it is to invite yourself to a table if you don’t know anyone there. Or if you are explicitly unwelcome there. But if someone calls out to you to join, you will probably go. Also, there are situations where the table is full and there’s no space for one more, even if you had the guts to try to squeeze yourself in. And if that’s the case, it takes even more guts to go find another chair and bring it forward. In my experience, if you know you’re welcome at a table but there’s no space, it’s easy for some people (like me) to go grab a chair. A more welcoming move would be if someone (usually a man) gives up their own seat to make room for you, then they go get another chair. But there are some people who would not at all go and get themselves seats. Whether it’s shyness or pride or something else. And if you sit at the table and people ignore you and don’t pause in conversation to acknowledge you, it doesn’t feel great. So taking this metaphor somewhere, I would say that allies should be in the business of giving up their seats at tables. Such as men who refuse to be on an all-male panel and suggest women who could take their place. The table is already set and it is too late to change the table, but they can still switch seats. The other issue I take with that quote is the folding chair. It implies inequality. That you accept to take an inferior seat at a table you weren’t invited to, rather than no seat at all. And I think Virtually Connecting might be that inferior seat but it might have evolved into something more. When Virtually Connecting first started as et4buddy, the dynamic was very particular. I had lots of friends at the conference, Rebecca had few. The desire to make the virtual connection was kinda egalitarian. I wanted to talk to my friends, they wanted to talk to me, Rebecca wanted to meet new people and this made her conference experience more enjoyable. As if I was there introducing her to new people all the time. Rebecca calls herself an extroverted but shy person. She loves being around people but would not have felt comfortable walking up to folks who didn’t know her and chatting with them. I’m guessing more so if they’re high profile. I have the situation of being friends with many high profile people in my field but not being able to travel. I guess… This reminds me of something Kate Bowles said about hospitality and vconnecting. In one sense, vconnecting is getting a folding chair, an inferior option, to join a table. In another sense, with vconnecting, I (or nowadays with a big team, WE) own the table and we are extending invitations to onsite folks to chat with virtual folks. So it would be considered an inferior chair at the conference, but if you look at the world in a more hybrid way, vconnecting is its own corner of a conference with its own rules that eschew academic traditions. Keynote speakers and early career scholars and students can all be invited to be onsite guests. Onsite buddies can be high or low profile people. Virtual buddies and guests can be anyone. Who gets to invite and facilitate these conversations? Virtually Connecting volunteers, many of whom are marginal in some way (international, grad student, low travel budget, alt-ac, contingent…. You name it) but a few of whom are high profile and established (although often this is their online presence/reputation more than their actual position they get paid for…which doesn’t afford them much travel… Think Bonnie Stewart, Alan Levine, and me). So back to this metaphor. Beyond vconnecting creating this new table at conferences, even though we have seats open for virtual participants to join in… We often need to explicitly invite them in if they’re new. Not only won’t they grab a folding chair, they don’t realize that vacant seats are welcoming them. Or they think they can only watch from afar rather than actually join a hangout and converse. So… Still working on that. Also, some people want to grab a seat. But they keep slipping out. Such as if they have internet/electricity issues or demands on their time from family for example. All the disadvantages of synchronous video. So vconnecting remains a very particular table that breaks down barriers in some way, but some barriers remain. This breaks down though. I often get invited to things I can’t attend. Some people are really cool and understanding and they know they’ll need to pay more to help me reach their table. E. G. DigPedLab last year made it affordable for me to bring my family and for a dinner invitation, Jesse made the first half of dinner alcohol-free. One conference organizer invited me to be on the organizing committee and offered to pay my trip and accommodation not just waive registration because he knew otherwise it would be almost impossible for me to go. Some conferences invite me to keynote and when I can’t make it, welcome my offer to keynote virtually. And some of them (like OEPS and Unicollaboration) do a great job of being hospitable to my keynote and it’s a great experience for all of us. Then there are the stupid ones. Who invite me to go to somewhere like the US like 2 months in advance (how can someone who has a kid, lives halfway across the world and a limited travel budget manage that in this kind of time frame?). Then when I offer to participate virtually…. They NEVER GET BACK TO ME. I am still mad about this. Do people think that inviting someone from a developing country is a favor? Did they tick their diversity boxes by throwing me a folding chair and hoping I’ll catch it and get there? What kind of invitation is that? If you really value someone, you make an effort to include them. You don’t just send an invitation then promptly forget about them. So here’s a big thank you to everyone who has ever helped include me or others at events that build social capital… Who helped modify a format so that others could be there. That’s a lot of vconnecting buddies but also conference organizers and onsite guests who valued the virtual presence and invited and embraced and advocated and cheered us on. 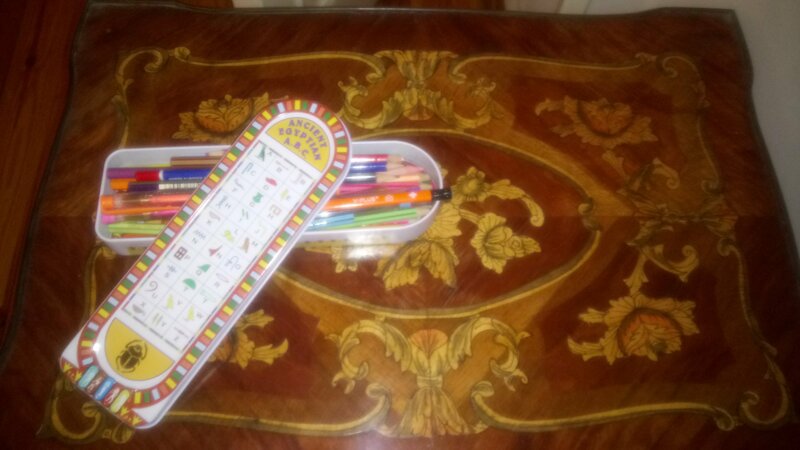 Featured image: a photo I took of a table at my house with an ancient Egyptian pencil case full of a smorgasbord of different types of my kid’s color pens and pencils. Post publication – George Station posted on Facebook a warning that we need to make sure when we’re invited to the table that we’re not on the menu. Discussion ensues on Facebook as to whether this quote is from Guess Who’s Coming to Dinner? or Elizabeth Warren said it or… something earlier… It’s a good point, in any case, because it could totally be the case! Beautifully stated and made to metaphor, Maha. And maybe sometimes you do not even need a table, just a circle of chairs. And its not even about the tables and chairs, but who’s in them, and the relationships/opportunities made/created because of the shared experience. The people who have continued to come to, be part of, contribute to VC to be the best kind of ego-less generous ones I like to be with. Also, I’m not sure I’ve seen mention of it (which does not mean it’s not been said) but I wonder if people who watch, participate in VC sessions get inspired to try that kind of conversational approach (over invited presentations) in their teaching. It was definitely an influence when Mia Zamora and I developed our Studio Visit series for #netnarr http://netnarr.arganee.world/studio-visits/ There is so much more to be gained for a conversation with an guest in your class than something focused on content. Let’s keep re-arranging or building our own furniture!